Home UncategoriesHow To Reduce Image Size Without Losing Quality? Stuck with above questions, then here is a sole solution. The pictures(JPEG/JPG) we shot from a digital camera go huge size depending on their quality and resolution. The normal size of images from digital cams could be 10 MB and Its a hard job for us to upload such images online in social network sites and even to send through emails. 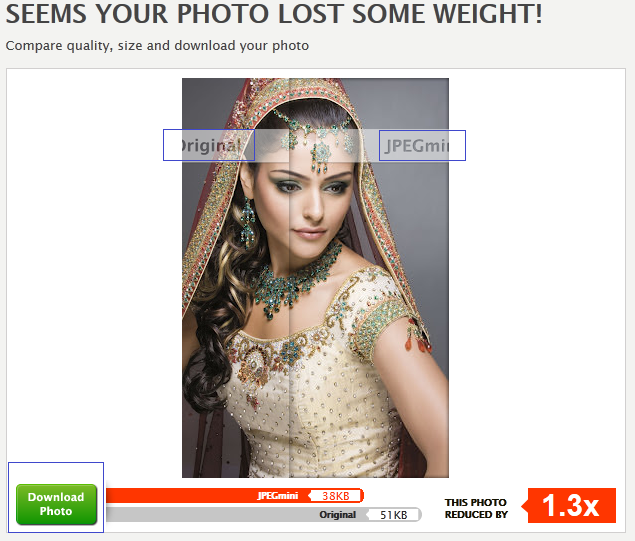 Hence, we look for ways to shrink the size of image to upload online or send via emails easily. There are many software's available on internet which can reduce your image size but the hectic task is you have to download, install on your computer and there could also be problems with trial versions. But now you can easily compress/reduce the image size without installing any software. JPEGMINI facilitates the users with an online image compressor service where you can easily reduce the file size of your pictures by up to 5xsize, without losing their original quality. Click on try it now Button or you can signup for a new account. Upload your photo-it will compress the image file online without losing any image quality-you can easily compare the original quality and jpegmini quality. Click on the download photo button and you are done.